German soldier dives for cover as shell explodes. Western Front, 1917. Many wartime photos of dramatic explosions, especially those with action like this one, are in fact staged after the fact. Maybe this one was as well. It may also be from a postwar film. Cameras were not light and handy like today, typically had slow exposure times and needed to be set up beforehand on tripods. Anyway this photo is probably not faked. Keep in mind the shrapnel has already dispersed by the time you actually see the explosion and dust. So if this soldier got hit by that shell, the metal has already gone through his body when this photo was taken. Shrapnel shells were anti-personnel artillery munitions which carried a large number of individual bullets close to the target and then ejected them to allow them to continue along the shell’s trajectory and strike the target individually. 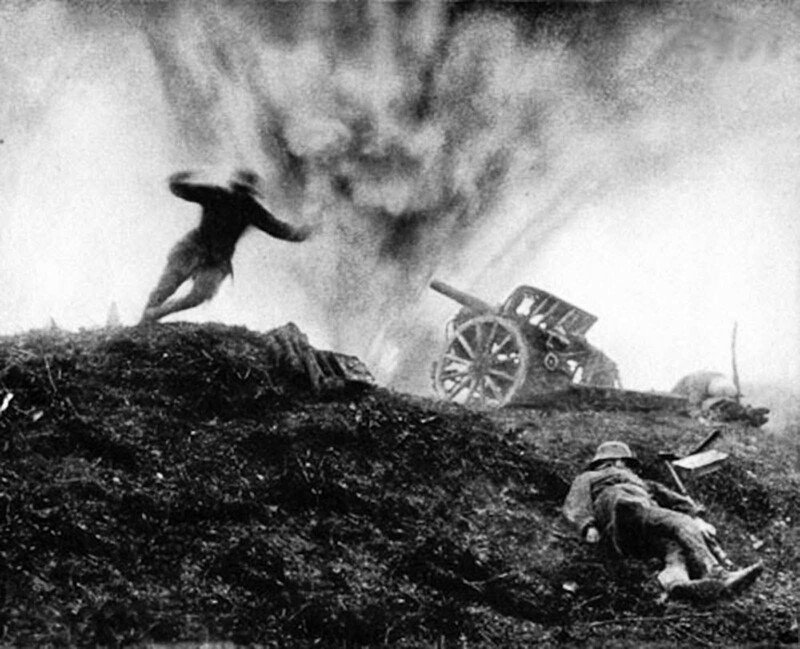 The munition has been obsolete since the end of World War I for anti-personnel use, when it was superseded by high-explosive shells for that role. The rapid dispersal of the shell’s contents, be it lead or steel, was designed to cause maximum casualties with minimal artillery effort. Inevitably shrapnel was best utilized against troops in the open, particularly massed infantry (advancing or withdrawing). There was a perceived belief that shrapnel were effective at cutting the barbed wire entanglements in no man’s land. But later was generally regarded as unsatisfactory for the task because the belligerents thickened their barbed wire strands. Shrapnel is named after Major-General Henry Shrapnel (1761–1842), an English artillery officer, whose experiments, initially conducted in his own time and at his own expense, culminated in the design and development of this new type of artillery shell.